Posted on May 23, 2013 by bradp@illinois.edu. A new time lapse video showing construction as it has progressed from January 2012 through April 6, 2013, is now available. Additional photos will be added to the photo gallery soon. And of course, you can always check progress via the webcam. Posted on January 14, 2013 by moone@illinois.edu. Last week we learned that a leak had occurred near the new ECE building. The leak was discovered on Sunday, January 6, in an area that was being prepped to tie the new building in to the University’s chilled water system.The basement of the new building received a large amount of water, as reported in the News-Gazette. Repairs to the pipe were made on Sunday, and the source of the leak has been fixed. The scheduled work to the chilled water system was also completed at that time. At this point, the specific cause of the leak has not been determined, but we expect no recurrence of this problem. Because the water that leaked into the building was from the campus cooling loop and has anticorrosion treatment, it has to be removed to the sanitary system, even though it is nontoxic. The removal was been coordinated with the Sanitary District, which set the rate of removal. The amount of water that leaked into the basement meant that it would take most of the week to remove it. It is expected that the basement will be assessed early this week. Posted on January 7, 2013 by moone@illinois.edu. Photos of the November construction are now live in the photo gallery. One of the recent highlights of December 2012 was the topping out ceremony that was held on December 12. 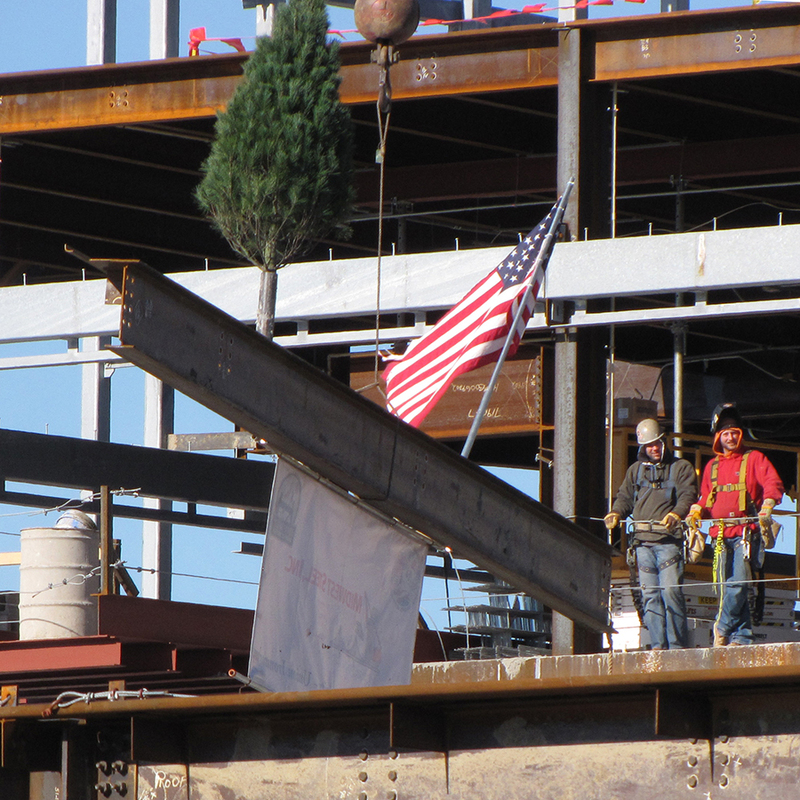 The iron workers had their ceremony, and put up a flag, banner, and tree to commemorate the work. The tree indicates an accident-free structure build so far. A topping out ceremony for the new ECE building was held by the iron workers on December 12, 2012. Posted on November 28, 2012 by moone@illinois.edu. We have been a bit remiss in loading construction photos for the new ECE building. But we have finally gotten caught up. You can find photos up through October 2012 on the photo gallery. I’m sure you will enjoy seeing the progress of the building as it moves to completion. November photos should be up next week! Posted on November 3, 2012 by tbean@illinois.edu. On October 26, ECE faculty, students, and staff had a unique opportunity to sign a beam that will be placed in the new ECE building. Hundreds showed up to put their signatures to the beam. The beam will be placed in the central section of the building structure, over what will be the main entrance of the new building. The beam will be visible while construction continues, but will eventually be covered up within the structure. Nevertheless, members of the ECE family will know that they have literally made their mark on this new building. The beam was chosen because of its size—it is one of the longest beams in the structure—and its location. Photos of the beam signing can be seen here. Interested in making a pledge over five years or want more information? Contact Beth Katsinas, Director of Advancement, at katsinas@illinois.edu or (217) 265-6285. Posted on October 29, 2012 by Laura Hayden. On October 26, ECE students, faculty, and staff had the opportunity to sign a beam that will be placed in the new ECE building. Several hundred members of the ECE family showed up to add their signatures to the beam and to enjoy some hot chocolate and other refreshments. The beam chosen is one of the longest ones in the structure, and it will be visible on the east side of the construction site for some time as construction of the center portion of the building continues. It will, however, eventually be enclosed within the walls of the building. Posted on September 3, 2012 by tbean@illinois.edu. On August 20, ECE Professor and New Building Committee Chair Philip Krein walked through the new ECE building. He shared some exciting, up-close shots of the construction. Posted on August 3, 2012 by tbean@illinois.edu. Sustainability has been an essential aspect of the ECE building since the beginning of its design process. It has been the goal to create a building that is a model of energy efficiency and sustainability. Those efforts have now begun to bear fruit. The design for the new ECE building has received the Green Good Design Award from the European Center for Architecture Art Design and Urban Studies and the Chicago Athenaeum: Museum of Architecture and Design. SmithGroupJJR, the architecture firm for this project, enthusiastically joined in our vision for the new ECE building, and their design received this prestigious award. With construction well under way, we know that we will soon be able to witness firsthand the success of this design. If you are interested in joining our Alumni Board, please contact Sara Heier at (217) 265-4227. Posted on July 26, 2012 by moone@illinois.edu. Welcome to our new blog. With this we will give more timely updates on the status of the building. Where possible, we will include guest postings from individuals who have more knowledge about upcoming topics with the new ECE building. One thing you can look for in the future on these pages is a new time-lapse video. You may have seen our video for construction of January through March. We are at work on a new video that will encapsulate the first six months of construction. We hope that you will use the comments capability of this blog to give us your feedback. We want to keep all our alumni and friends informed, but being so close to the project, we may not know what you want to know. Tell us if there’s something you want more information on. And you don’t have to agree with everything that’s going on with the building or with what we post. However, remember that generally accepted levels of civility will be enforced. Posted on July 5, 2012 by krein@illinois.edu. The steel framing continues at a quick pace. The first floor steel decking material is starting to be added this week.